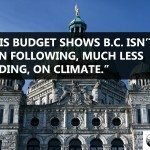 VICTORIA –First Nations, labour, environmental and legal organizations are calling on the B.C. 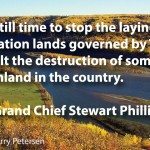 and federal governments to suspend construction of the Site C dam pending completion and full consideration of an independent review by B.C.’s Auditor General. “This project must be paused immediately, before actual dam construction begins. Site C is an unnecessary project that will result in all of us, including the poorest among us, paying far higher hydro bills. The proposed megaproject is an obvious threat to First Nations’ Title, Rights and Treaty Rights and interests. We absolutely demand that a credible independent review is done before any further work on this project proceeds,” said Grand Chief Stewart Phillip, President of the Union of BC Indian Chiefs. If built, the 60-metre dam would be the single-most expensive megaproject in B.C.’s history and would flood more than 100 kilometres of river valley lands along the Peace River and its tributaries. In addition to destroying burial grounds, and important cultural, fishing and hunting sites of Treaty 8 First Nations, the reservoir would result in the loss of prime farmlands capable of growing sufficient fruits and vegetables to feed one million people, according to expert testimony before the Joint Review Panel. In addition to the Auditor General’s review of the Site C project, many individuals and organizations have called on the provincial government to subject the project to even more rigorous review with full procedural safeguards. “All of us would like to see the Site C decision evaluated by the BC Utilities Commission, which as the electrical utilities regulator has the expertise and the quasi judicial powers to ensure a thorough, public review. Absent that, the Auditor General’s review is both welcome and needed and the public would best be served by halting further work at Site C until such a review is done,” said Karen Campbell, a lawyer with Ecojustice.